The aim of this project was to establish a vision and development framework for the Woodside, Firhill, and Hamiltonhill areas of north Glasgow which are adjacent to the Glasgow branch of the Forth and Clyde Canal. The Vision, Development Framework and Masterplan were prepared in close liaison with stakeholders and the local community via a ‘charrette’ process and informed by a rigorous understanding of the area. The key innovative approach was the intensive and creative charrette engagement process that involved a variety of engagement techniques, over an intensive four-day period, including a significant art outreach programme, and involved dialogue with more than 300 people. Unconventional approaches such as the use of a paper boat as a symbol of change were successful. The process established priorities for the area, such as the importance of a cohesive green infrastructure area. An area of ‘vacant and derelict land’ has now been re-designated as a local nature reserve. Establish a Vision and Development Framework for the Woodside, Firhill, and Hamiltonhill areas of north Glasgow which are located adjacent to the Glasgow branch of the Forth and Clyde Canal. A masterplan for the canal corridor between Applecross and Firhill Basins was also to be prepared that will form the basis for a Planning Permission in Principle application. The Vision, Development Framework and Masterplan were to be prepared in close liaison with stakeholders and the local community via a ‘Charrette’ process and informed by a rigorous understanding of the study area’s baseline condition. The project addresses the Woodside, Firhill and Hamiltonhill areas of North Glasgow through which the Glasgow branch Forth & Clyde Canal corridor passes. The study area is located approximately 1km to the north of Glasgow City Centre. Despite this these disconnected and disadvantaged communities, (Woodside, Firhill and Hamiltonhill) persistently lie within the 15% Scottish Index Multiple Deprivation (SIMD) most deprived areas in Scotland and they suffer some of the worst health statistics in the country. There are currently large areas within Woodside, Firhill and Hamiltonhill, as well as within the central canal corridor that are either vacant or lying in a state of dereliction. This includes significant underutilised greenspace assets. As part of the Glasgow Canal Regeneration Partnership Action Plan 2014 the GCRP identified the regeneration potential of the canal corridor between Applecross Canal Basin and Firhill Canal Basin, and its potential to influence positive change on adjoining neighbourhoods and provide access to meaningful greenspace. Funding was provided by GCC via it’s the Vacant & Derelict Land Fund to support this study to explore that potential and establish a robust development framework informed by significant stakeholder and community support. 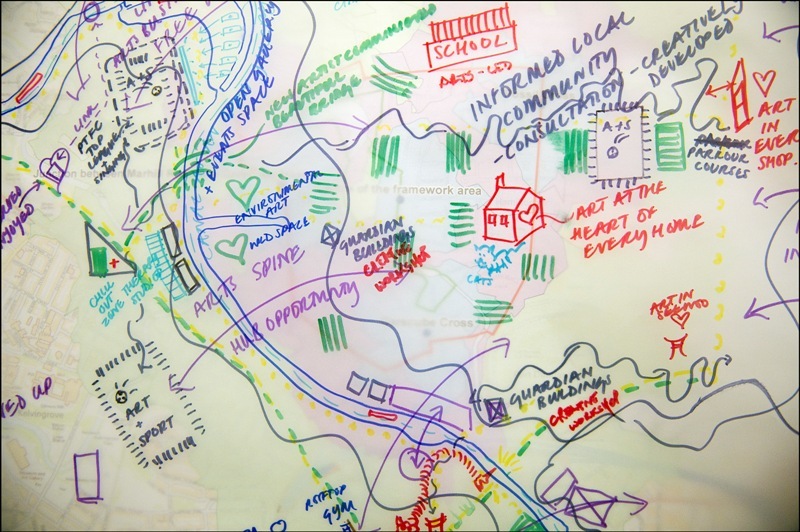 Through an intensive 4 day ‘Charrette’ stakeholder and community consultation process with significant art outreach, which all together was named ‘What Floats your Boat?’, the project has established a Vision for the Woodside, Firhill and Hamiltonhill areas integrated with the canal corridor. The Charrette involved dialogue with over 300 stakeholders and members of the local community and it united their individual strengths to provide a cohesive development framework for the area. This has set the scene and context for development proposals as they come forward. The Charrette was based at Partick Thistle FC’s Firhill Stadium which is located within the study area. Over 4 days the Charrette comprised a series of guided walks, presentations, and a range of different interactive group workshop sessions culminating in a final Presentation and art festival on the last day (which coincided with Partick Thistle v Inverness Caledonian Thistle playing in a Scottish Cup tie at Firhill Stadium that day which resulting in the project’s exposure to several hundred Partick Thistle supporters). Within this context a Vision was established and then translated into a spatial Development Framework for the area. This sets out the development potential, connectivity enhancements, greenspace improvements and a high level arts and cultural strategy. Taking reference from the Development Framework a masterplan has also been prepared for the canal corridor between Applecross and Firhill Basins, which corresponds with the area formerly designated as ‘Vacant & Derelict Land’. In addition to establishing an overall Vision, the Charrette was to consider two scales within the study area boundary; a development framework for the wider Woodside, Firhill and Hamiltonhill area; and a more detailed masterplan for the canal corridor between Applecross and Firhill Basins. During the charrette a sequence of sessions was programmed that led participants and the team progressively from exploring and identifying key issues in the site area currently, to thinking creatively about the future. Thereafter different scenarios of the future were tested, which in turn led to the production of a Vision, a draft development framework and masterplan that the team presented on the final day. In early discussions with stakeholders it was acknowledged that the term ‘Charrette’ could be off-putting to potential attendees. Therefore the decision was taken to ‘brand’ the Charrette with the title ‘What Floats Your Boat?’ to convey a sense of interest, fun and participation. ‘What Floats Your Boat’ was used on all correspondence and communication surrounding the charrette. Following the Charrette, with continued liaison with key stakeholders, the Woodside, Firhill and Hamiltonhill Development Framework was finalised with continued liaison with project stakeholders. 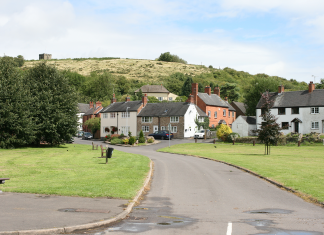 This project links landscape sensitivity and green infrastructure studies to provide weighty and robust evidence to allow the county and local planning authorities to be proactive rather than reactive in accommodating future development.